Is your lab using an earlier version of BIOQUANT? Need to justify an upgrade to the latest version? Here are 10 reasons to upgrade to the latest version of BIOQUANT Life Science. We here at BIOQUANT want to be on the latest operating system. Why? We like being at the forefront of technology. We like improvements. We like computers with big monitors and lots of memory. Windows 10 support is part of our secret plan to achieve our number one goal: To make the protocols super fast. The 1280x960 resolution of the QIMAGING BIOQUANT PV1 digital camera is optically matched to the resolving power of high-magnification objects (0.5 microns per pixel and above). This avoids the blurry images found in other so-called "high-resolution" cameras with smaller pixels that oversample the optical design of the objective. An accurate threshold is the key to automated measurement. BIOQUANT has made significant progress in automating the creation of accurate thresholds. Starting with the initial color, scrolling the mouse wheel up will search the image for similar colors and add them to the threshold automatically. Scrolling the mouse wheel down will find the colors in the threshold that are least similar to the initial color and remove them automatically. The "Clean" button searches the image for all "small" bits of threshold and deletes them. This makes it quick to isolate the important parts of an image from the surrounding tissue despite non-specific background staining. The "Keep" button allows you to mark just the parts of the threshold you need and then deletes the rest. Precise multi-band thresholding means you can combine multiple highly specific color ranges into one composite threshold. You can capture all the subtle variations in a stain. You can identify both lightly stained and darkly stained cells at the same time. You can identify cells stained with different fluorochromes at the same time. Threshold colors can be assigned to specific arrays now. This means your threshold color will always contrast well with the both the specific stain you're trying to measure and the counterstain. BIOQUANT Life Science uses a new palette of high-contrast colors. Open scans in the TIF, BMP, or BIF image formats. This makes it easy to work with digital slides from BIOQUANT SCAN and many other digital pathology scanners. With a 20X lens, that's more than 300 mm2 of tissue. Having access to the entire section, means BIOQUANT can zoom out to rapidly measure large structures hippocampus area, then zoom in to measure cells within any structure. All this combines to make data collection fast. Camera presets make is simple to switch between brightfield, polarized light, and fluorescence imaging. Presets store exposure time, gain, and white balance settings to standardize imaging and reduce setup times. BIOQUANT SCAN controls a motorized stage with the help of an autofocus camera to automatically scan histology slides or well plate cultures. Analysis of digital scans is faster to perform and easier to train. BIOQUANT can zoom out to measure referent data at one time for the entire section. Moving around a high magnification is faster and simpler when all you need to do is drag a box around the Large Image Navigator. Play Button for Integrated Video Tutorials make it easy to find the help you need when you need it. For example, click the play button in the Measurement region to learn about the various measurement tools. Click the play button in the Threshold region to learn how to automatically identify stained cells. When BIOUQANT starts, a welcome screen appears. This allows students to start one of the many tutorials, continue where they left off, or start a new project. BIOQUANT comes with an ever-expanding library of tutorials. Some tutorials focus on general system functionality. Others focus on collecting specific kinds of data from particular tissues. Tutorials include standard data templates, instructional guides, and sample histology. BIOQUANT now allows nearly every stage of a protocol to be assigned to measurement arrays reducing most protocols to only a handful of steps. You can assign threshold color, measurement color, preview color, calibration, topo array, region of interest type, threshold type, threshold range, measurement type, outline filter settings, measurement filter settings. Files used with the data sets like Guides, Selected Lists, Calculation Lists, Measurement Filters, and Threshold Ranges can be assigned to dataset. Default assignments have already been made to every template dataset in BIOQUANT. Our constant goal at BIOQUANT is to improve the speed of data collection. Standard analysis templates are continuously improved. Many steps have been eliminated, making data collection faster. BIOQUANT LIFE SCIENCE now has as a specialized measurement type for the analysis of skeletal muscle. This significantly simplifies what used to be a complex multi-step protocol in to 3 simple steps. BIOQUANT LIFE SCIENCE now has a standard template for the analysis of retinal structure particular the thickness of various layers in the retina. BIOQUANT LIFE SCIENCE now has templates for the analysis of axon number, axons size, axon caliber and axon shape. These templates are applicable to a variety of animal models including non-human primate models of glaucoma. BIOQUANT LIFE SCIENCE provides standardized tools for the analysis of blood vessel morphology. Data range from measures of lumen area, to internal and external elastic lamina, to computation of percent stenosis. BIOQUANT LIFE SCIENCE has standard templates for the computation of proliferation index. The templates are able to analyze tissue stained with a variety of techniques. The most common is DAP for PCNA+ cells with an eosin counterstain. One of the primary tasks of BIOQUANT is the automated analysis of cell populations. A specialized tool set makes this work fast and simple even for students who are new to image analysis. Here's an example of how the protocol works for the analysis of axon number, cross-sectional area, and diameter. Zoom out to define the area where cells will be counted using either a digital scan of your section or a microscope fitted with one of our imaging kits. 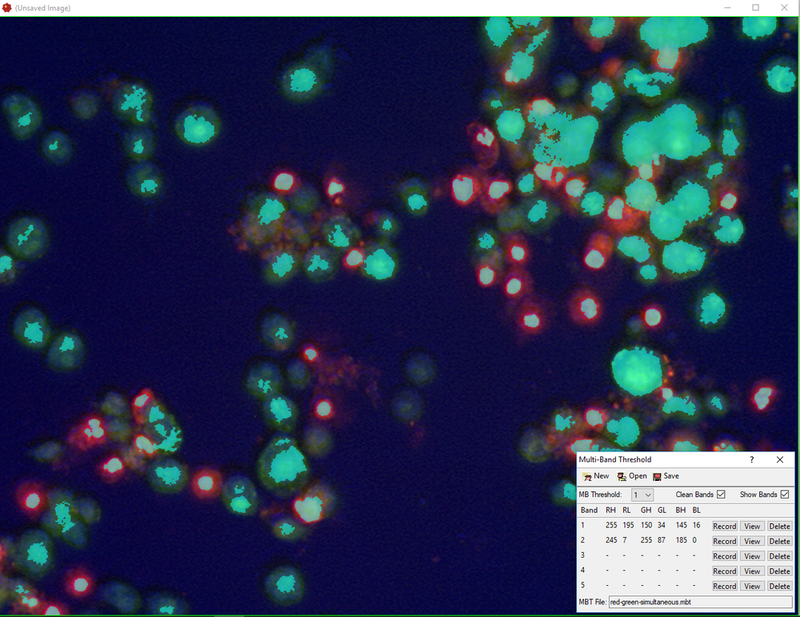 Using BIOQUANT’s automated polychromatic thresholding, identify the specific cells to be counted. After making any necessary manual edits to the cell detection, measure the cells. Move to the next overlapping field of view using a digital scan of your section or a microscope equipped with one of our imaging kits. Automated filters in BIOQUANT detect previously measured cells and make sure they aren’t measured twice. Analysis of skeletal muscle in particularly challenging because so many different parameters must be measured for each muscle cell. Most often these are: myofiber cross-sectional area, roundness, shortest diameter, position, optical density (for fibertyping), and number of central nuclei. BIOQUANT now includes a specialized tool precisely for this task. Zoom out to define the area where myofibers will be measured using either a digital scan of your section or a microscope equipped with one of our imaging kits. Zoom in to the measurement area to begin counting using a digital scan of your tissue or one of our imaging kits. 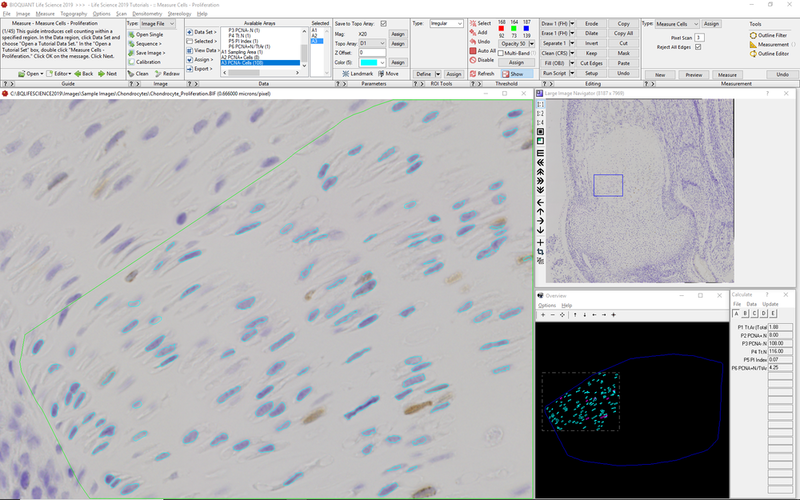 Using BIOQUANT’s automated polychromatic thresholding, identify both myofibers and nuclei. BIOQUANT then analyzes the myofibers to measure area, diameter, shape, location, and optical density. It also determines the number of nuclei within each myofiber. 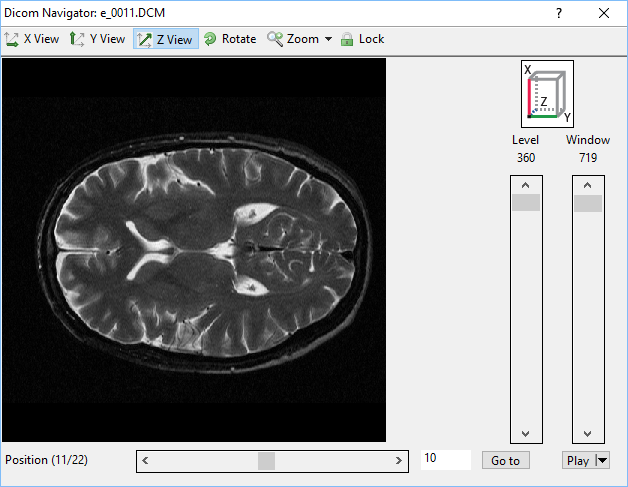 The new DICOM navigator for MRI data, quickly analyze the volume and shape of structures. Compatible with batch processing, BIOQUANT can rapidly analyze stacks of DICOM format images. To aid in visualizing data, a set of 8 new pseudocolor palettes make monochromatic data more vibrant. Labs with active Technical Service Plans receive on-demand training via remote desktop sharing. Use this service to train new students, learn new software features, and design new data collection protocols. Work with our technicians to develop customized analysis templates. Start with one of our standard templates and improve it to match your samples. Or, build your own unique protocols from the ground up. Get quick solutions to software and hardware problems by phone, email, or remote desktop. Each year, BIOQUANT publishes an upgrade to BIOQUANT Life Science that is included at no charge as part of the Technical Services Plan. New versions add features requested by the community, consolidate protocol steps, and introduce new types of measurement tools. This version of BIOQUANT LIFE SCIENCE takes the longest strides toward distilling the complexity of analyzing biological tissues down to the simplest of procedures. With a standardized workflow documented with both written and video tutorials, BIOQUANT combines intelligent object detection with simple tools for manual correction to rapidly analyze even the most complex biological samples. Let us help your lab today.